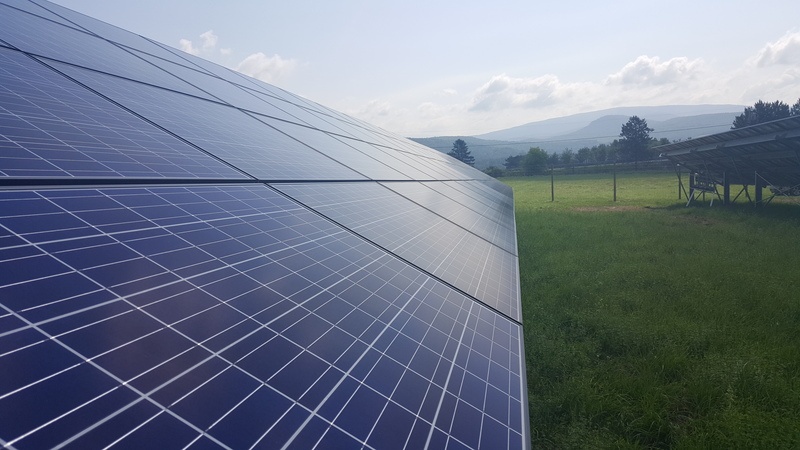 Kyocera Solar, Inc. announced today a partnership for an innovative Community Solar Array (CSA) Program in Vermont that offers a cost-effective way to participate in solar. Approximately 50 projects averaging 200kW each will enable consumers to virtually purchase about 13 megawatts of solar power without installing individual rooftop systems. The CSA Program is a group effort coordinated by Kendall Sustainable Infrastructure (KSI), an impact investment firm and principal sponsor; Kyocera, a leading solar manufacturer providing solar panels and additional capital; and SunCommon, Vermont’s largest residential solar company heading project development, EPC and ongoing support. Under the new CSA Program, landowners within an electrical service territory can arrange to dedicate a portion of their property to generating clean energy — a new “cash crop” helping farmers and Vermont landowners stay on their land. Each acre of solar panels generates enough electricity to power about 30 homes. Participants enroll to virtually purchase power generated by solar arrays within their service territories. Solar power is fed into the grid, and participants purchase an amount of grid power equal to that generated by the arrays. The partnership expects to construct 50 CSAs, with nearly a dozen online or expected to be operational by year-end and the remainder in 2016. Kyocera Corporation of Kyoto, Japan, recorded consolidated sales of $12.7 billion in the fiscal year ended March 31, 2015. The company has a 40-year tradition of innovation in solar energy research, development and manufacturing, with a U.S. customer base served by Kyocera Solar, Inc. of Scottsdale, AZ. SunCommon is a Vermont Benefit Corporation founded on the belief that everyone deserves a healthy environment and safer world – and that clean energy is where it starts. Now the state’s largest residential solar business, SunCommon is a Certified BCorp committed to the triple bottom line of people, planet and profit. Kendall Sustainable Infrastructure, LLC (KSI) is an investment firm affiliated with Kendall Investments focused on building, financing and owning sustainable infrastructure projects and renewable energy assets. The firm works closely with investors, developers, product suppliers and other parties to build world-class renewable energy facilities that have positive, long-term financial, social and environmental impacts.